Soooooo what are we looking at here? We’re looking at T2108, a percetage graph representing the percentage of stocks above their 40 day simple moving average. Don’t take my word for it but I learned from somewhere that 40 day simple moving average is the de facto average for mutual funds. T2108 is only available at Worden. Historically, the T2108 has shown some interesting patterns against the major averages such as the S&P 500. Here it is. *note: green is T2108 and cyan is SP-500. As you can see, as the T2108 touched the 80% line which is the white horizontal line that connects the apexes of the green graph, the SP500 readily fell down precipitously. Where are we now? We’re almost there. 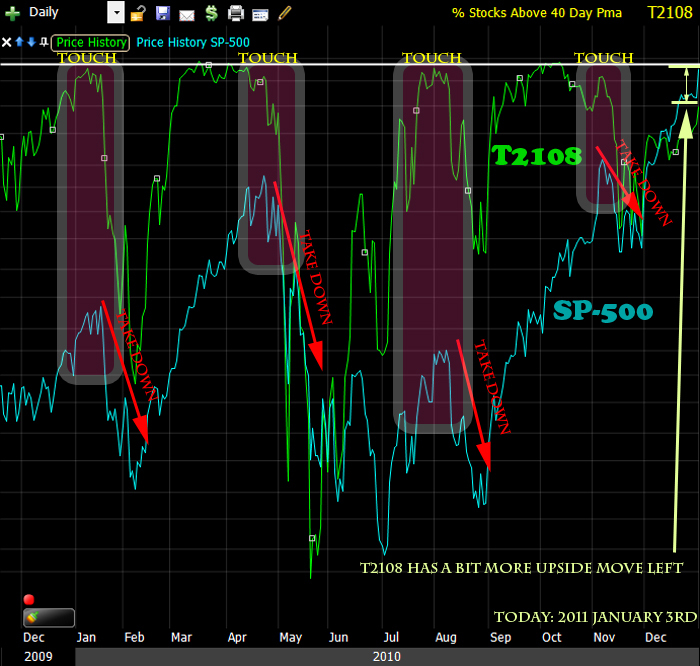 There is some room for the green line, the T2108, to get dangerously close to the 80% line. It looks like we have 2 or 3 days after which, coincidently, we’ll start getting job report figures: We’ll get the ADP report, initial job claims, and the employment report on Wednesday, Thursday, and Friday, respectively. I’m not predicting the market would fall like it has in the previous instances. I’m only anticipating such a move. If you are a long term investor, you might want to buy a 5th of what you expect to invest because it’s still possible that this market keeps going up. If you are a medium term trader like me, I would nibble a little here and there and put a tight stop. For example, I would not extend my risk above 0.5%; if I’m wrong, I lose less than 0.5%. If you’re a day trader, this is the time to make a lot of money. I’m in F, AXP, GILD, GS, and WPRT with tight stops at the moment. When all the equities fall, we gonna get down it.